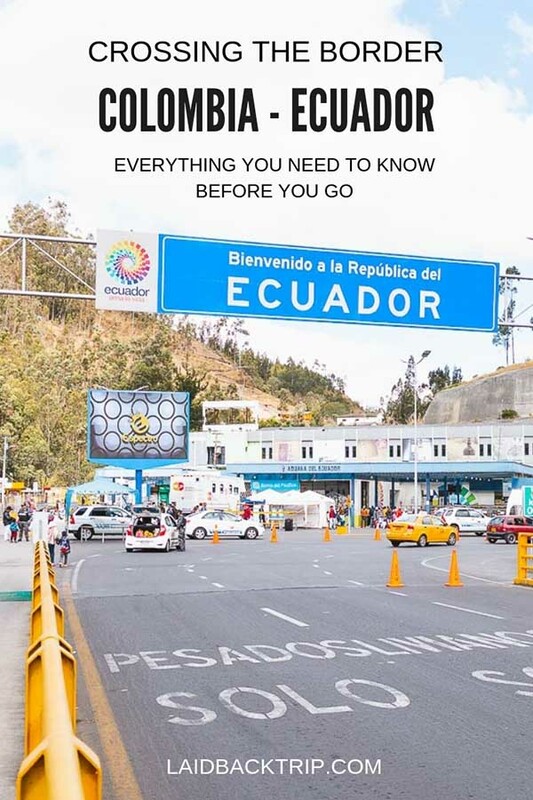 This post will guide you on crossing the border from Colombia to Ecuador by land. How to safely get from Colombia to Ecuador via Rumichaca border on your own with public transport. Travelers who want to get from Colombia to Ecuador by land usually use the most common route via Rumichaca border crossing between cities Ipiales on the Colombian side and Tulcan in Ecuador. This border crossing is considered safe, and you shouldn't have any problems. The only issue could be the time as you can never know how long the procedure will take. We recommend getting there early so you won't be stuck in the queue. We got from Ipiales to Tulcan in less than two hours, but we met a girl who told us that her friend waited in Rumichaca for ten hours a month ago. We believe this was only bad luck and this is not a standard. Ipiales is a city only 5 minutes drive from the Rumichaca border. It is not a pleasant city, and if you don't have to, we don't recommend to roam around, especially after dark. You will most likely arrive from Cali, Popayan or Pasto. We were coming from Popayan as we spent several nights before in San Agustin. Popayan lies supposedly 8 hours drive by bus from Ipiales, and the cost is COP 35 000 (we don't believe that the bus made it in 8 hours ever, it took us 10 hours plus the bus arrived one hour late from Cali). You can split your journey and spend a night in Pasto, 2 hours before Ipiales. In Ipiales, we can recommend a very nice and safe Hotel San Jose Ipiales, only two minutes walk from the bus terminal, so it is convenient as you don't need to walk around and it is easy to get from the city the next day. Although there are shuttle buses running between the bus station in Ipiales and border crossing, we found out that taking a taxi will be safer, more comfortable and it cost only COP 8 000. Staff at the front desk will help you call a cab. It was funny that the taxi dropped us off technically behind Colombian borders, so we had to walk back to get a stamp that we are leaving the country. Do not skip this part and don't walk directly across the bridge to Ecuador Immigration. You need to get the confirmation that you have left the country, otherwise, they will send you back and you'll lose precious time. If you have some Colombian Pesos left, you can change it here. Immediately after we arrived, we were approached by a woman who offered us a reasonable exchange rate. You won't need pesos anymore, so don't worry. Go to the Colombian Immigration Office. There was a queue outside on the right, but it was for Colombians, follow the left line. There's an officer in front of the door, show him your passport, he will let you in and tell you in which line to wait. Get a stamp with the date of your departure from Colombia. Leaving Colombia is free, do not pay anything if asked. Now you must walk less than five minutes to the Ecuadorian Immigration Office via Rumichaca Bridge. You can also take a taxi, but it is not necessary at all. We were quite surprised how freely we could walk around and when considering how the police and army presence in Colombia is strong, we couldn't have believed that we didn't see anyone here on the borders. As a foreigner, you don't need to wait in the queue outside the Ecuador Immigration Office in a cage-like corridor. Go directly inside and wait a bit to get your passport stamped. You don't need to pay anything, and also you don't need a proof of onward travels (always check if the policy did not change). We didn't have to fill any forms either. From Rumichaca crossing, you can either take a bus to Tulcan, or taxi. You can always share a cab with fellow travelers if you don't want to wait for a crowded bus. Taxi cost $3 and will take you to the bus terminal in Tulcan in about 15 minutes. It doesn't matter if you go to Otavalo or Quito, it is easy to get a bus from Tulcan. We arrived by taxi to the bus terminal, and in less than five minutes we were on a bus going to Otavalo. The bus ride takes 4 hours and costs $4. If you carry on to Quito, add another approximately 2 hours and $2. The bus was of a good quality, be aware of thefts in the buses in Ecuador. Always watch your bag, do not leave it under your seat or up in the racks above your head. Keep your bag on your lap even though it is not very comfortable.